The floral kurtas on both are a bit too overbearing for us but we have to say we do prefer how Anjali toned it down with white churidaar! Juhi’s pink silky patiala still makes us cringe! You can catch more pics of Anjali and Sachin from the event at “The Gallery”. Her first award ceremony ever and Anushka chose to wear silk pants and a beige top bringing back memories of a certain Ms. Chawla. We expected much more but I guess we should be glad that she didn’t wear yet another Malhotra creation. What’s with Juhi’s new fond love for mixing bad prints with shiny patialas! It ain’t the first time but we hope it is the last! 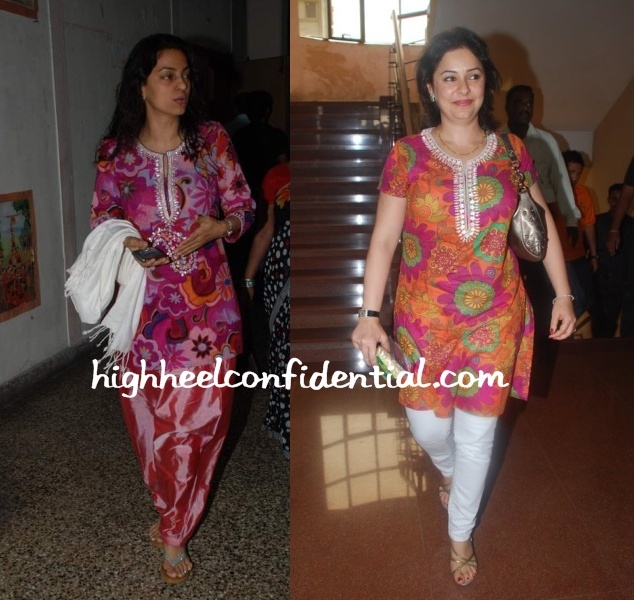 It’s been a while since we spotted one and the latest entrant to the ‘Birkin Watch’ is Juhi. Can’t be sure since the image is bad, but we suspect she is carrying the smaller version also seen on Anju Taraporewala. P.S. We’ll post more pics once we find her carrying it more.